It is interesting to note that pseudo-hermiticity condition fails to preserve spectral invariant nature in nearly degenerate quantum states of single and double well operators. 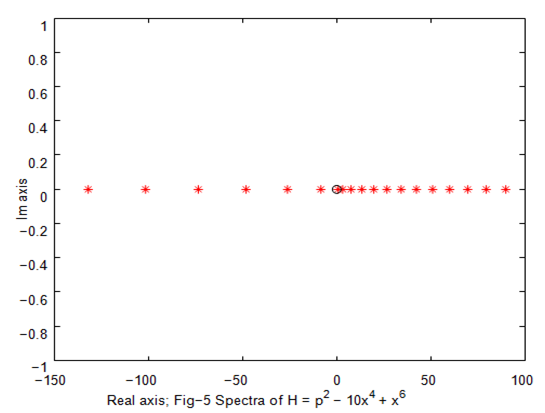 In other words no spectral similarity exists between nearly degenerate energy eigenvalues of Hermitian operator and corresponding PT-symmetry operator. Now question arises as to if (i)h = hermitian or h = non–hermitian.2 If h is hermitian then both < ϕ n |and| ϕ n > MathType@MTEF@5@5@+= feaagKart1ev2aaatCvAUfeBSjuyZL2yd9gzLbvyNv2CaerbuLwBLn hiov2DGi1BTfMBaeXatLxBI9gBaerbd9wDYLwzYbItLDharqqtubsr 4rNCHbGeaGqkY=MjY=Pj0xh9v8qiW7rqqrFfpeea0xe9Lq=Jc9vqaq pepm0xbbG8FasPYRqj0=yi0dXdbba9pGe9xq=JbbG8A8frFve9Fve9 Ff0dmeaabaqaaiaacaGaaeqabaWaaeaaeaaakeaacqGH8aapdaabca qaaabaaaaaaaaapeGaeqy1dy2aaSbaaSqaaiaad6gaaeqaaaGcpaGa ayjcSdGaamyyaiaad6gacaWGKbWaaqqaaeaapeGaeqy1dy2aaSbaaS qaaiaad6gaaeqaaOGaeyOpa4dapaGaay5bSdaaaa@45F8@ are well behaved like that of | ψ n >or< ψ n |. MathType@MTEF@5@5@+= feaagKart1ev2aaatCvAUfeBSjuyZL2yd9gzLbvyNv2CaerbuLwBLn hiov2DGi1BTfMBaeXatLxBI9gBaerbd9wDYLwzYbItLDharqqtubsr 4rNCHbGeaGqkY=MjY=Pj0xh9v8qiW7rqqrFfpeea0xe9Lq=Jc9vqaq pepm0xbbG8FasPYRqj0=yi0dXdbba9pGe9xq=JbbG8A8frFve9Fve9 Ff0dmeaabaqaaiaacaGaaeqabaWaaeaaeaaakeaadaabbaqaaabaaa aaaaaapeGaeqiYdK3aaSbaaSqaaiaad6gaaeqaaaGcpaGaay5bSdGa eyOpa4Jaam4BaiaadkhacqGH8aapdaabcaqaa8qacqaHipqEdaWgaa WcbaGaamOBaaqabaaak8aacaGLiWoacaGGUaaaaa@45DF@ In other words spectral invariance exists between h and H. This may be a case of spectral invariance in non-degenerate quantum systems. In this context we would like to state that Mostafazadeh3 has explored some features relating to discrete non-degenerate levels. However till now no literature on similarity transformation is available involving nearly degenerate quantum levels pertaining to either single well or double well operators. In this context we would like to state that the recent paper of Rath4 has explored some interesting features on similarity transformation. However the aim of this paper is to explore eigenvalue relation between H and h, when H is having nearly degenerate eigenvalues. As reported earlier it is bounded3 in its behaviour. In this case one has to solve the recursion relation satisfied A m MathType@MTEF@5@5@+= feaagKart1ev2aaatCvAUfeBSjuyZL2yd9gzLbvyNv2CaerbuLwBLn hiov2DGi1BTfMBaeXatLxBI9gBaerbd9wDYLwzYbItLDharqqtubsr 4rNCHbGeaGqkY=MjY=Pj0xh9v8qiW7rqqrFfpeea0xe9Lq=Jc9vqaq pepm0xbbG8FasPYRqj0=yi0dXdbba9pGe9xq=JbbG8A8frFve9Fve9 Ff0dmeaabaqaciaacaGaaeqabaWaaeaaeaaakeaaqaaaaaaaaaWdbi aadgeapaWaaSbaaSqaa8qacaWGTbaapaqabaaaaa@3A04@ considering different matrix size  and calculate the eigenvalues. 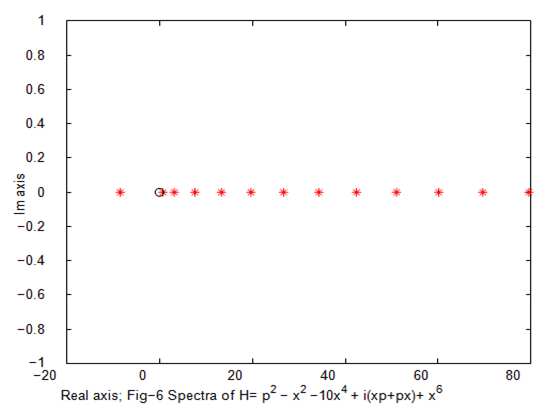 Figure 1 Nearly degenerate eigenvalues. 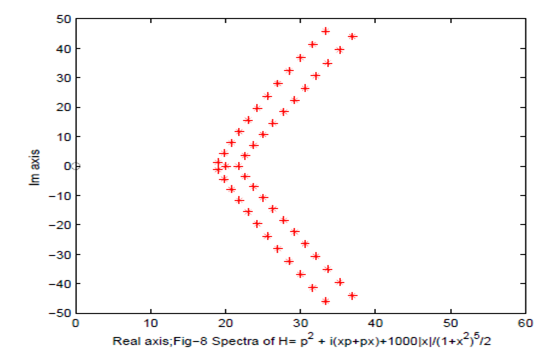 Figure 3 Nearly degenerate eigenvalues. 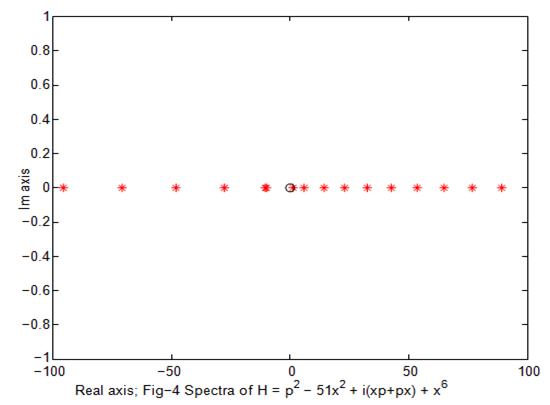 Figure 5 Nearly degenerate eigenvalues. 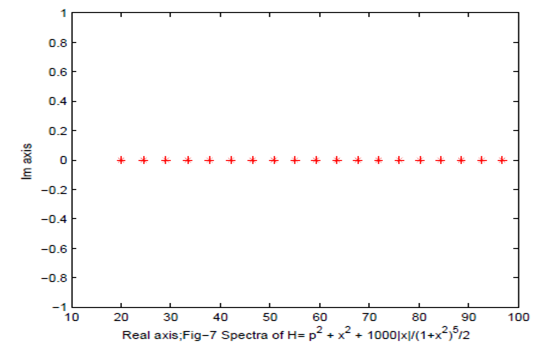 Figure 7 Nearly degenerate eigenvalues. 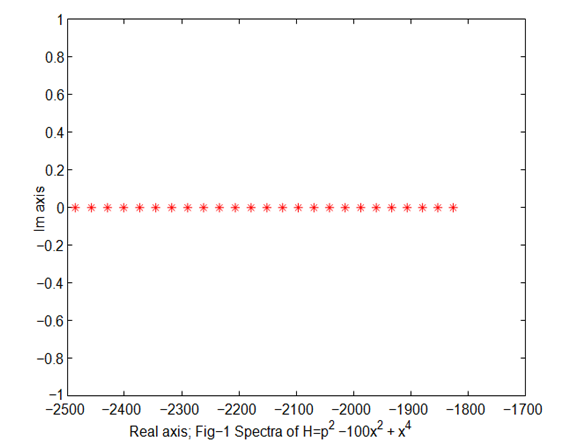 There is no spectral variance. Similar case exists for all operators cited above. However it is not known at present, why the spectral variance exists in large parameter reflecting nearly degenerate states? Author is grateful to Referee for constructive remarks. Bransden BH, Joachain CJ. Quantum Mechanics. New Delhi: Pearson Education Ltd. 2000. 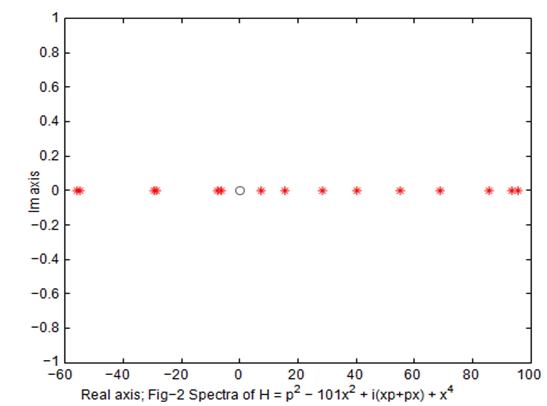 Bender CM, Boettecher S. Real spectra in Non-Hermitian Hamiltonians having PT-symmetry. Phys Rev Lett. 1998;80:5243−5245. 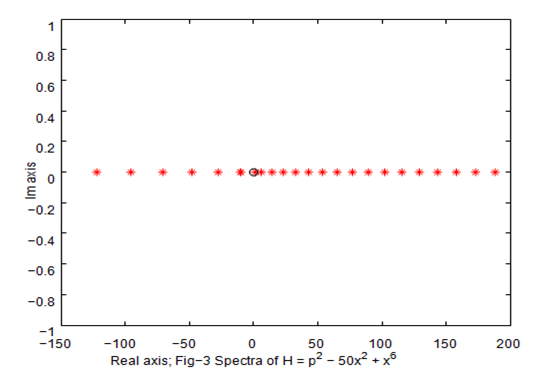 Mostafazadeh A. Pseudo-hermiticity versus PT-symmetry the necessary condition for the reality of the spectrum of a non-hermitian Hamiltonian. J Math Phys. 2002;43(1):205–214. Rath B. Similarity transformation in PT-symmetry: limitations. Open Acc J Math Theo Phys. 2018;1(4):164–166. Balsa R, Plo M, Esteve JG, et al. Simple procedure to compute accurate energy levels of a double-well anharmonic oscillator. Phys Rev. 1983;D28:1945–1948. ©2019 Rath. This is an open access article distributed under the terms of the Creative Commons Attribution License , which permits unrestricted use, distribution, and build upon your work non-commercially.